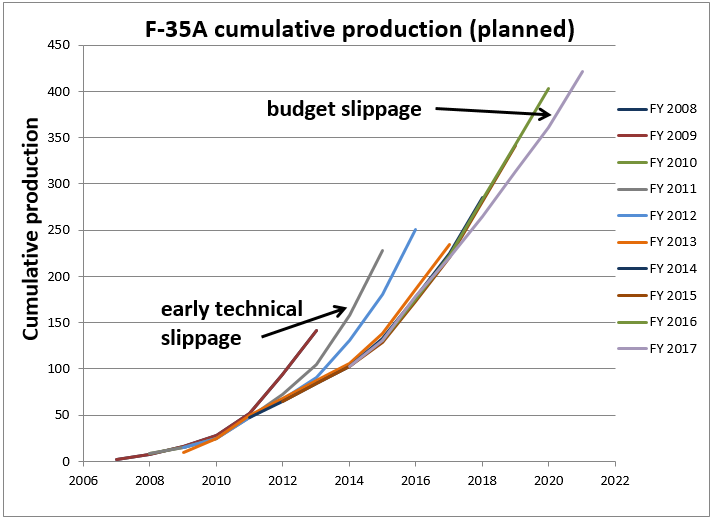 As I’ve been doing for the last few years (2013, 2014 and 2015), here’s my analysis of the US Air Force’s most recent budget plans for the F-35 Joint Strike Fighter. 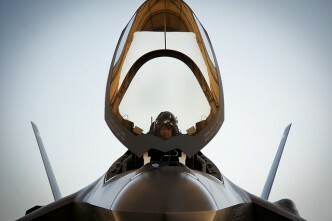 As the defence press has been reporting for a while now, the USAF faces a looming ‘bow wave’ of acquisition costs as it tries to fund the acquisition of F-35s, tankers, drones and C-130 transport aircraft, as well as the development of the new long-range strike bomber. Funding isn’t likely to come at the expense of other American capabilities—ICBMs and nuclear missile subs and the Ford-class carriers will all require big bucks in the F-35 acquisition timeframe. And don’t even mention sequestration. In this environment something had to give, and we can see the impact of budget pressure on USAF F-35 plans in this year’s budget figures (PDF, see table on p.71). The USAF has deferred the acquisition of 45 aircraft over the next five years—roughly 10% of its planned cumulative fleet by 2021. The 2013–16 plans all had production rising to 60 A-model aircraft (the version the Royal Australian Air Force will acquire) per year by 2018. This year’s revision cuts that back to 44 aircraft in 2018, 48 in 2019 and again in 2020, and then 60 per year from 2021 to the mid-2030s. The chart below shows the net effect in cumulative numbers. 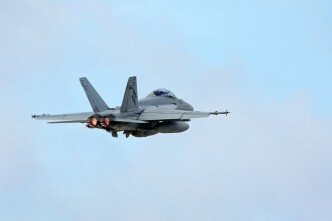 Unlike the early days of the program, where production was deferred due to technical immaturity of the aircraft, this deferral appears to be purely budget-driven. That’s a potentially significant development for Australia, because we’ll be buying more than 30 aircraft over the period 2018–21. We’ll pay whatever the production cost at the time is, so any loss of economy of scale has the potential to increase the sticker price. 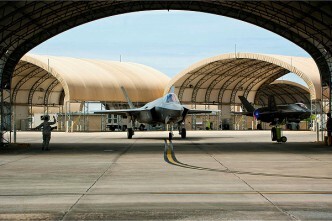 The Joint Program Office is playing down the impact on prices, and there’s always the possibility of other customers taking up the slack through foreign military sales, or of Congress voting more funds for F-35 acquisition than the Pentagon requested, like they did last year and the year before (as well as voting funds for a dozen Super Hornets the USN doesn’t want). 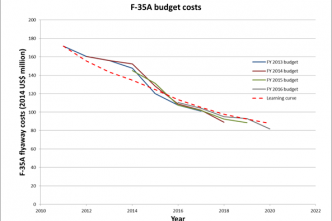 But the USAF’s own figures suggest that they might be assuming a noticeable impact on the F-35’s unit cost. 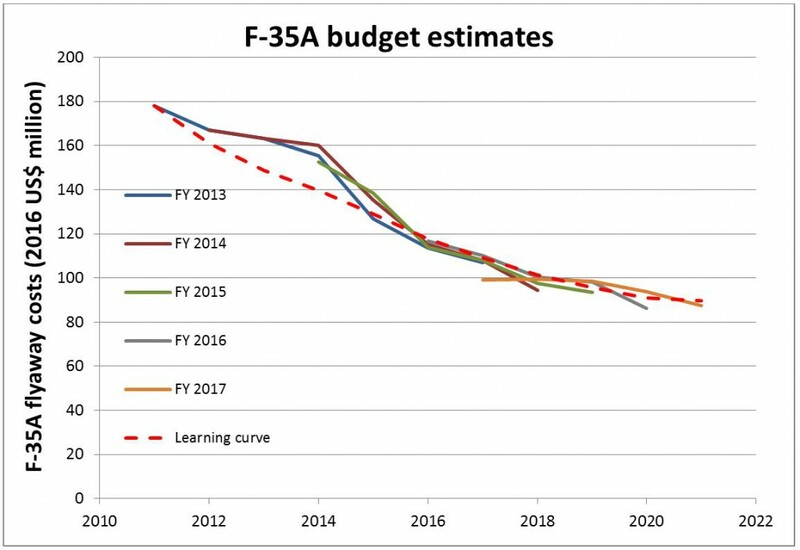 The following chart shows the cost projections from the past five USAF budget requests, along with a calculated curve that corresponds to industry best practice ‘learning effects‘. The FY 2017 figures clearly show a planning assumption of a flatter cost-versus-time curve than in the past, including a per aircraft increase of around US$7 million in the 2020 purchases compared to last year’s figure. If those figures play out in practice, it looks like Australia will be paying more for its aircraft. 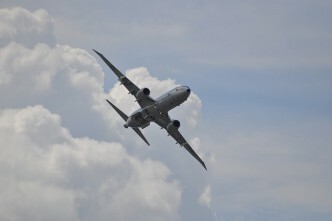 Taken at face value, the additional cost could be US$150–200 million (on top of an expected US$3 billion) over the first 30 aircraft in the next tranche. However, the actual premium could be less than that. 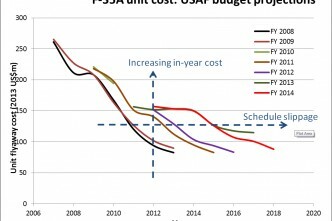 USAF budget requests have proven to be conservative in the past few years, and recent Low Rate Initial Production contracts signed between the Pentagon and the contractor Lockheed Martin have come in below the budgeted figures. That’s seen the overall projected acquisition cost reduced by 3%, according to the US Government Accountability Agency (PDF, see p.15). Table. 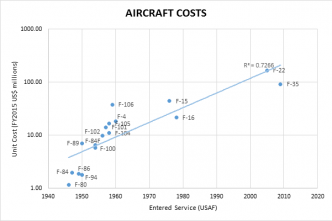 F-35 average procurement costs (constant US 2016 $m) since 2012 rebaselining. 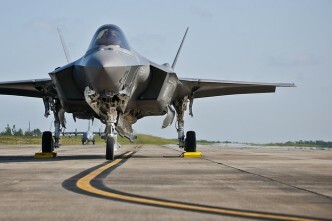 In summary, the ‘state of the union’ budget report on the F-35 is that acquisition of the aircraft continues steadily, though the expected growth in the next few years has been deferred due to budget pressures in the US. Perhaps ironically, given the early history of the program, that’s happening at a time when all of the indications are that costs are coming down. What the net implications will be for Australia isn’t entirely clear, but we may end up paying a little more later this decade. 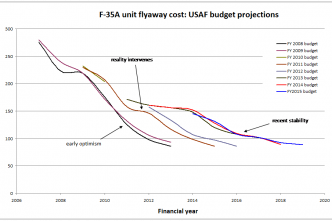 Author’s note: the chart of F-35A flyaway costs in an earlier version of this post included some data points calculated with the wrong deflator. The conclusions of the article are unchanged by the small numerical error that resulted. Andrew Davies is senior analyst for defence capability at ASPI. Graph of the week: up, up, but finally away?